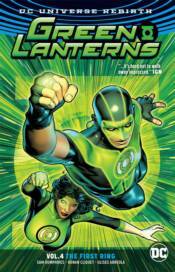 Simon Baz and Jessica Cruz venture into space to train with the Green Lantern Corps! But will they reach their destination when Jessica is jettisoned out of transluminal travel and forced to find her way through the void of space? Meanwhile, the Corps agrees to work with the Sinestro Corps to protect the universe, one Green and one Yellow per sector. So what does this mean for Sector 2814-and Simon and Jessica's partnership? Collects GREEN LANTERNS #22-26.